As part of our general and personal statistics page redesigns we have updated the look and data on the Annualized Net Return on Investment graph. Our approach is to provide a more complete reading of returns and how they compare to benchmarks. 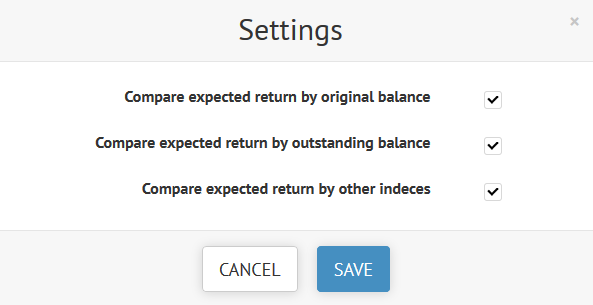 Users can click the small display setting icon in the top right corner to select which of these comparison options they want included in the graph. We’ve selected Barclay’s Pan-European High-Yield Index as a benchmark for your Bondora performance. We believe this is a reasonable basis for measuring the success of your portfolio. While risk levels vary due to differing investing styles (conservative, aggressive, etc. ), the overall nature of a Bondora portfolio is similar to that of a high yield bond index because you are lending money and earning interest. Barclay’s index is marked on the graph with orange line. You’ll notice that on the General Statistics page we’ve seen consistent outperformance of this benchmark as seen by the realized current net return (Xirr). The same data point is available for your own portfolio on your personal statistics page. This data is represented with a blue line. Hover over each dot for a reading of the performance month or quarter. The green line represents the portfolio’s expected return. This calculation is simply the weighted average of the expected return multiplied by the outstanding principal. The value ranges are marked on the graph with light green. This darker green line is calculated by taking the weighted average of the expected return multiplied by the purchase price of a note. The value ranges are marked on the graph with darker green.